Gabe and Tom share a laugh on February 6th at St. Cyril's Hall in Binghamton, NY. Fritz, Frank, Tom, Mike, and Gabe are shown here during a break in their gig of February 6, 2010 in Binghamton, NY. Mike keeps the beat during FPB's gig on February 5, 2010 in Vernon, NY. Gabe rips through a tune on his Parker at Ring Eyed Pete's Bar at Vernon Downs on February 5th. Tom with his Gibson on February 5, 2010 in Vernon, NY. Frank is shown here playing bass during FPB's gig at Ring Eyed Pete's Bar in Vernon, NY on February 5th. Hidden behind a myriad of cymbals is FPB drummer, Mike Faraino on January 31, 2010 in Verona, NY. Side profile of Mike keeping the beat on January 31st in Verona, NY at the Sir Issac J. Tucker benefit. Fritz, Tom, and Gabe are shown here during FPB's gig in Verona, NY on January 31st. 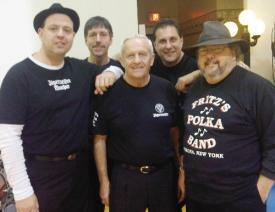 Fritz's Polka Band rips through a tune on January 31, 2010 in Verona, NY at the Sir Isaac J. Tucker benefit. 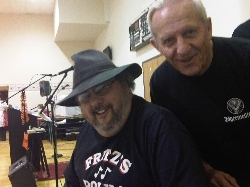 Fritz's Polka Band tears through a tune on January 31st in Verona, NY. FPB drummer, Mike Faraino poses here with a friend of many years who just happened to wear a Floating Noah t-shirt to FPB's gig on January 31, 2010. Mike formerly played in Floating Noah for many years. Tom, Mike, and Fritz are shown here having a Jager toast with Jessica Zieman and Greg Wilson (of Painted Black) prior to FPB's performance at the benefit for Sir Isaac J. Tucker. The guys in Fritz's Polka Band present a Jager tanktop to Jessica Zieman on January 31st, prior to their gig in Verona, NY. 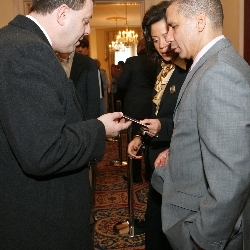 Fritz presents a "Jagermeister presents Fritz's Polka Band - Tribute" CD to Governor Paterson and First Lady Michelle Paige Paterson on January 1, 2010 at the Governor's Mansion in Albany, NY.